A pic would definitely help! Here's a link for you to upload a pic to the gallery. Once uploaded, use the "camera" icon in the text editor to attach it to a post. Are you applying any foliar sprays, by any chance? Have you checked the UNDERSIDE of the leaves with a magnifying glass? What brand of nutes are you using? Are you mixing with RO water? Don't know if I can jump in here or not. It's displaying a few yellow spots. It has been under a humidity dome, it may have had some water on leaves. Get rid of the dome immediately, Donvito. That's a sure way to kill it. Domes are for plants without roots. Even then, they are not usually needed. Get that little gal into some soil or whatever ASAP. She'll thank you for it. I'll keep the dome off in the future apart from clones. Any thoughts on the spots, is that dome/humidity? I can't be sure, but that's my guess. Plants need to breath = fresh air. The domes are for plants that need limited transpiration because they have no roots to take up water effectively. Too much humidity can cause mold or rot. 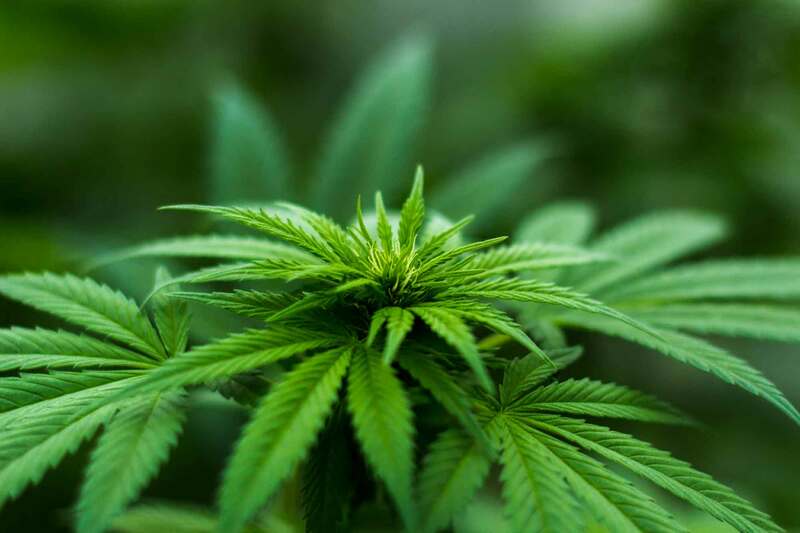 Plants with roots want plenty of CO2. They get the moisture they need via their roots. You mentioned the leaves were wet. 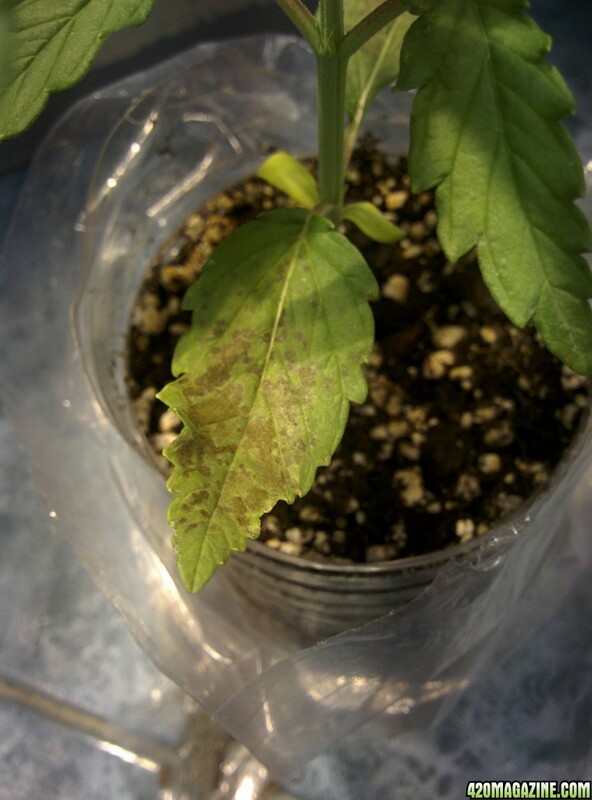 When that happens, the water droplets can act like a magnifying glass under the lights and can cause burn spots on the leaves. 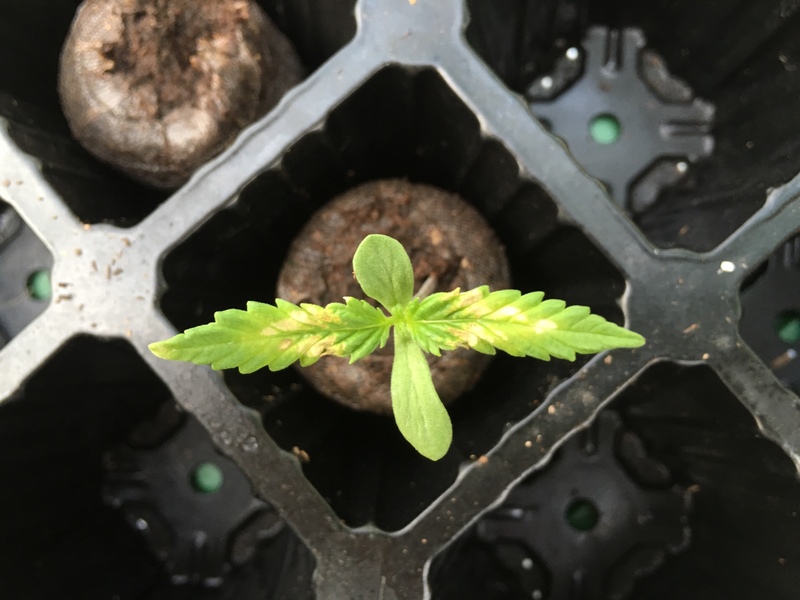 She doesn't look like she's wilting and is much too young to have any nute deficiencies, so I would think that light burn would be the most likely cause. The soil appears to be compacted. What is it? 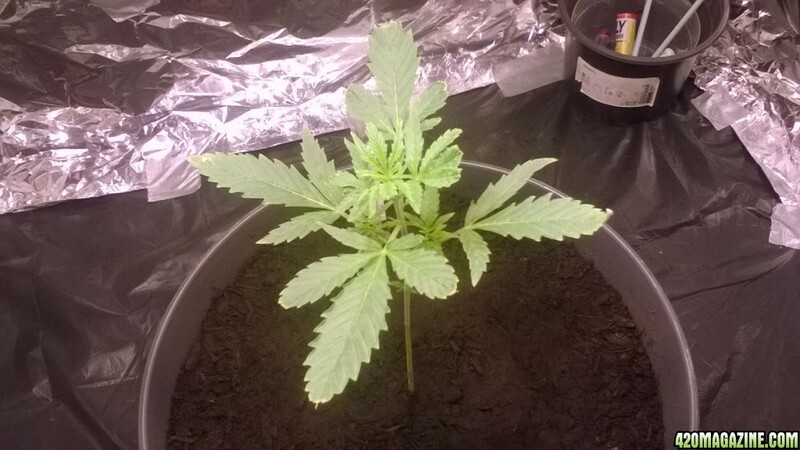 i just put it in strawberry soil and using hydro coco nutrients and she is 11 inch nearly a foot tall and i did compact the soil a bit should i not have done that ? Well done!!! Thank you very much. Please someone help me, this baby was doing just fine. 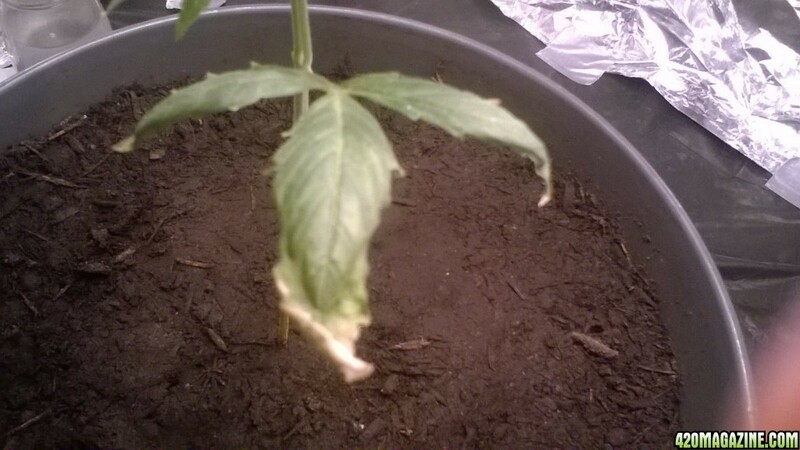 I noticed the weird stains on her bottom leaves, a few days have passed and it has progressed into this. What are you growing in? Is that a bag around it? It's in atami bi grow mix with added perlite. It's a plastic bag so the water has somewhere to drain. I didn't have any small pots. Hey everyone. I have a problem and I'm not sure what's going on. Hopefully someone can help me? Here's some info on my Grow and setup. 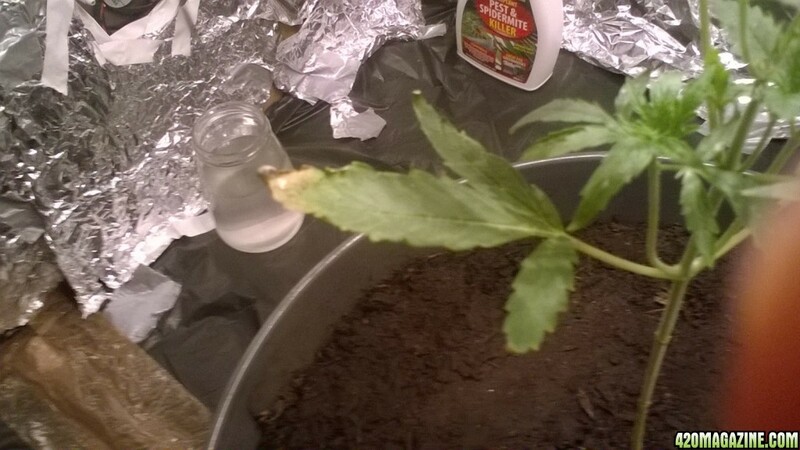 Strain: unknown Auto mystery seed from supreme seed. Bought a 10 pack of variety mystery autos. Looks like a Calcium deficiency. Give her some CalMag at next watering.....a nice alfalfa tea is always nice as well. Are you keeping the pH within 6.2-6.8 range? Some deficiencies can be due to "lockout" if pH not monitored.